Madhya Pradesh Vyavsayik pariksha mandal has started the recruitment of Samvida Teacher Bharti MP, in Middle schools, Ucch Madhyamik Shikshak of Madhya pradesh Sashan . 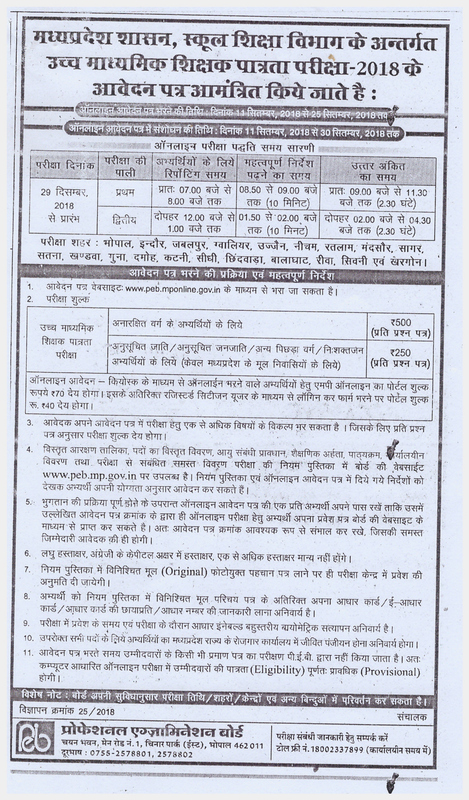 प्रोफेशनल एग्जामिनेशन बोर्ड / PEB, has publish recruitment Notification for Samvida Shala Shikshak Shreni – 2. There are total no of approximate no of vacancies are 17000 including various categories. Age limit: minimum 21 year and maximum 40 year for Samvida shala Shikshak bharti 2 Age will be calculated on 1 January of year of results declaration. Qualifying cutoff marks | Minimum passing marks. Only those candidates who will score minimum qualifying marks they will get eligibility certificate for Samvida shala Shikshak bharti pariksha. Qualifying marks percentage will be as are following category wise. Selection Procedure: MP Vyapam (Madhya Pradesh Vyavsayik pariksha mandal Bhopal) will conduct written examination for MP Samvida SSS 1, SSS 2 recruitment. MP Vyapam will conduct a written examination which will carry total 150 marks. Written examination: question paper pattern as are following. Minus marking will not applicable in the written examination. Difficulty of questions paper will be high school level and questions will be asked from syllabus prescribed MP Government for class 6 to class 8 and class 9 to class 10. How to apply: all interested candidates can fill application form online through the official website of MP Online. MP Online Portal Charges will be payable extra by candidates. July ka first week nikal chuka hai kab tak aa rahi hai vacancy. Bharti ke liye ankhe taras rahi hain. Such rule in cbse board also apply here. Sir maine bba hr se or bed kiya hai varg 2 ka exam de sakta hu kya? Sir..koi new information ayi h kya samvida exam k bare me..
sir,is something approximate date is there for this vacancy ? Kab aayenge form sss ke. Sir I am B.E (cs) and doing B.ed am i a valid participant of varg 2?? YE LOG HUM STUDENT KA MAJAAK UDAA RAHE HAI INKO KUCHH NHI PTA KAB AYEGI EXAM DATE " AGEGI BHI YA NAHI"
Kha commerce ke student samvida varg do mein fofm bhar skte hai?